Once you see a photo of Kotor Bay made from the ancient ruins in mountains above, you cannot help but dream to visit this place. Kotor in Montenegro was a photographic dream for Nico for at least two years, but it always seemed to be such a long journey from Berlin, as there was no good flight connection. 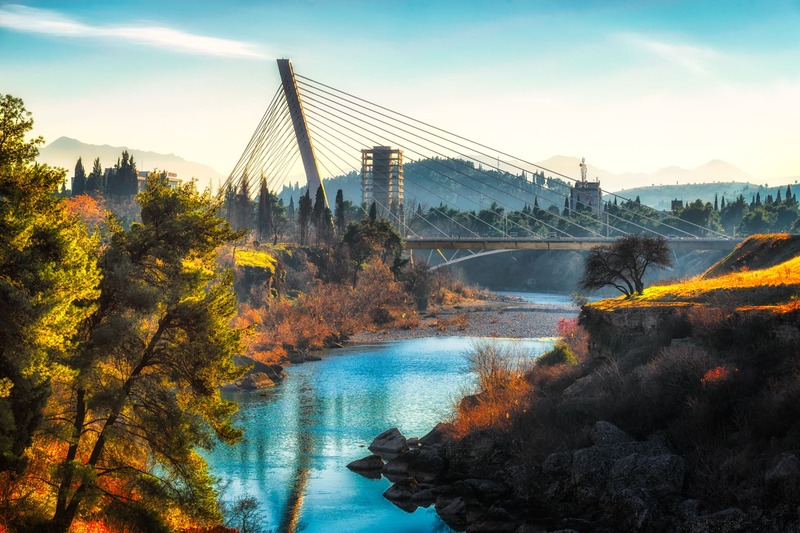 This was until the moment we decided to spend our New Year’s Eve in Podgorica, which is just a 65 km drive from Kotor – we couldn’t miss the opportunity. On the first day of 2017, we left Podgorica and headed to Kotor. 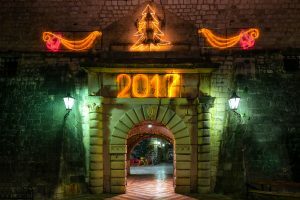 Taking the fewer buses going to Kotor on the 1st January into consideration, we took a taxi. It turned out to be a very good idea, as the weather was just perfect, and for around 2 hours, we had time to admire the landscape with its dark green valleys and black mountains (from which the name “Montenegro” comes from). Only a few fluffy clouds were laying on the tops, and it seemed to us that they looked tired after celebrating last night. A few times, our heart-rates rose when the driver took 180-degree turns, and we could see the precipice and the turquoise sea, if for only a moment. When we reached Kotor, our blood pressure went up even more from the excitement. You couldn’t see the Adriatic Sea from the shore. In this part of Montenegro, the sea goes deep into land and the mountains, creating ria – a submerged river canyon, which looks like a fjord – the Boka Kotorska in the language native to this region. The water was turquoise, which contrasted with the overhanging cliffs – Orjen and Lovćen, which looked like they were closing the bay from this perspective. Behind us, the white town buildings stood in contrast to the dark mountains, that loomed over the small pale buildings. 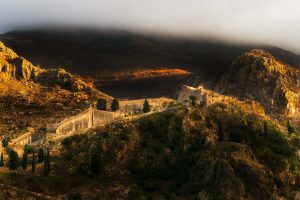 In the warm light of the setting sun, you could see the ancient fortress of Kotor; so peaceful and empty at this time. We left our luggage unpacked in our Airbnb apartment, grabbed the camera, some slices of pizza and went to shoot photos before the night came. It was a good beginning to a new year! After a few hours of walking around, we discovered that Kotor is quite a thing during the night as well. The whole ground in town was covered with white cobblestones which, when wet from the evening air, reflect lights in a way that the entire city looked like it was made from marble. In souvenir shops, we saw postcards with “Kotor cats”. In the beginning, we thought it’s because of those stones (in polish cobblestones” are called “cat stones”), but then when we looked down and saw plenty of cats in all shapes, sizes, and colors running through the streets with their loud meowing. It was a real cat city! Kotor is a UNESCO World Heritage site – as well the old town of Kotor and the Venetian fortress up on St. Johns hill. The old town itself is small (961 inhabitants, according to Wikipedia), but you can lose your way all the time. Even though, there is one thing you can be sure of – once you think you’re lost, you will always eventually come back to the square of the Cathedral of Saint Tryphon – the seat of Roman Catholic Bishopric. The cathedral was built in 1166 and is one of the most ornamental buildings in Kotor from the medieval times. It stands almost in the middle of the town, and it is impressive to see its white walls contrasting with the mountains above. 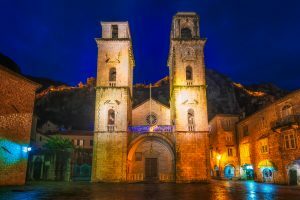 Apart from this cathedral, Nico liked the architecture of the Sea Gate and the River Gate of Kotor – parts of the city’s fortification, which dates back to the 9th century. He liked it so much so, that he woke up before sunrise to capture them in the “blue hour”, when the city still sleeps. Winter is an appropriate time to visit Kotor, as there aren’t too many people coming by cruisers. We could enjoy the town without squeezing through the crowds. It was also a good opportunity for Nico to take photos without people on them. 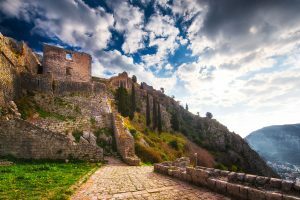 However, as soon as we decided to climb up to the Venetian fortress overlooking the city, we discovered that we are not the only foreigners around, and it seemed to us that everyone just comes to Kotor, skips the town, and goes to see the fortress. We spent almost all day on Saint John’s hill, where the fortress is located. We walked up and down, trying to find the perfect composition for photos, out of breath the whole time, being amazed by the view of the town with its red rooftops at our feet, the turquoise water of the bay and the dangerous-looking dark mountains above. The Kotor Fortress on St. John hill unites the architectural styles from Illyrian, Byzantine and Venetian styles. The fortress was built in the 6th century by emperor Justinian I. The construction was finalized, however, during Venetian times, when the town succumbed to Venetian rule. Nowadays, the ruins of the fortress are the only remains of its glory, but they are still breath-taking, and not only because you must climb hundreds of steep stairs to see it fully. It was also a dose of adrenaline to simply climb there, as the stairs are not well-restored in every part, and sometimes, the view was directly under our feet. Kotor fortifications were severely destroyed by earthquakes, with the most recent one in 1969. In the same year, they were placed in the List of UNESCO World Heritage sites in danger. Even though the restoration took place in 2003, it was mostly done in the city. The upper fortress still bears the signs of time, erosion and earthquakes – so, once you’re there, watch your step! However, in those unpreserved ruins, we found a kind of melancholic beauty. So, in the end, we were very happy to see it so wild, before the restoration changes its look. You can describe the history of Kotor, write about how it looks, but words are sometimes not enough. In the end, after seeing the photos from Nico’s camera, Daria gave up on writing something that could match the views captured on film. The contrast of the colours of the water, the dark mountains and the city buildings were unique. Though, Kotor was not an easy location to reach for us, we didn’t regret effort of getting there and seeing this city of contrast.